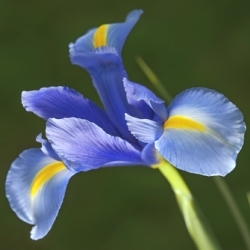 Dutch Iris are considered to be one of the most beautifully shaped bulbous flowers available. Ideally, they are used to fill the gap between Spring and Summer plants. Also known as 'Hollandia' they are a long-lasting, excellent cut flower or border item. They'll come back in Southern gardens. June. 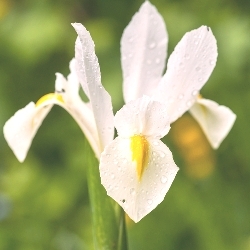 Our Dutch Iris Collection contains 30 each of Telstar, Casa Blanca, and Apollo. Bulbs are individually packaged and labeled. 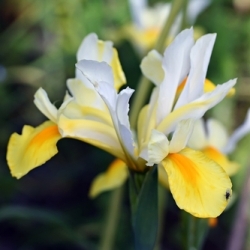 Apollo Dutch Iris have rich yellow falls with pure white standards and is lightly scented. 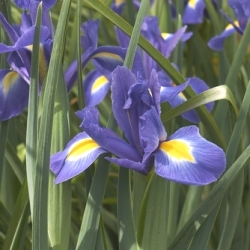 Blue Ribbon Dutch Iris has rich velvety purplish-blue falls with standards a shade lighter. Sunny yellow blotches accent the crest. The purest blue of all. Casa Blanca Dutch Iris have pure white standards with a touch of gold on the falls. 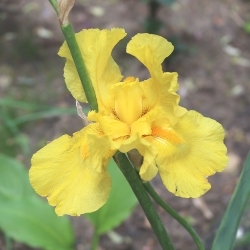 Golden Giant Dutch Iris has brilliant golden yellow blossoms. True to its name the flowers are extra large. Hildegarde Dutch Iris has a soft blue to lavender flower with a yellow blotch on its falls. 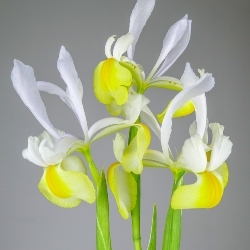 Symphony Dutch Iris are elegant flowers with creamy yellow falls and ivory-white standards. 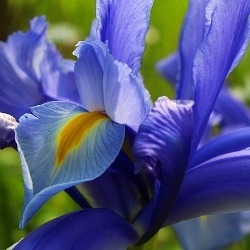 Looks great contrasted with deep blue or purple irises. Telstar Dutch Iris is the quintessential Iris, with its deep blue falls that beautifully contrast with striking yellow patches on the falls. One of the most popular Iris varieties. A nice mixture of the above Dutch Iris varieties.